I'm a sucker for a good bold print, and although this print from the very colorful Milly for Kohl's collection also came in a dress version, I went with the pencil skirt due to the flattering material. Plus, I wanted to pair it up with this cool (not-so cropped) crop top from the Elle collection which was also at Kohl's. This top had its own matching skirt, however it was not as flattering this skirt! I came to the realization that sometimes pieces reach their full potential when you cross collections/stores/price/etc, it all comes down to what flatters your body. I also realized that I like having outfits like this on deck for when special events pop up. In this case, as you might have seen, I wore this to the Vince Camuto Fashion Valley soft-opening and then to the Omnia San Diego media night. I liked how this outfit proved to be versatile in both totally different scenarios! 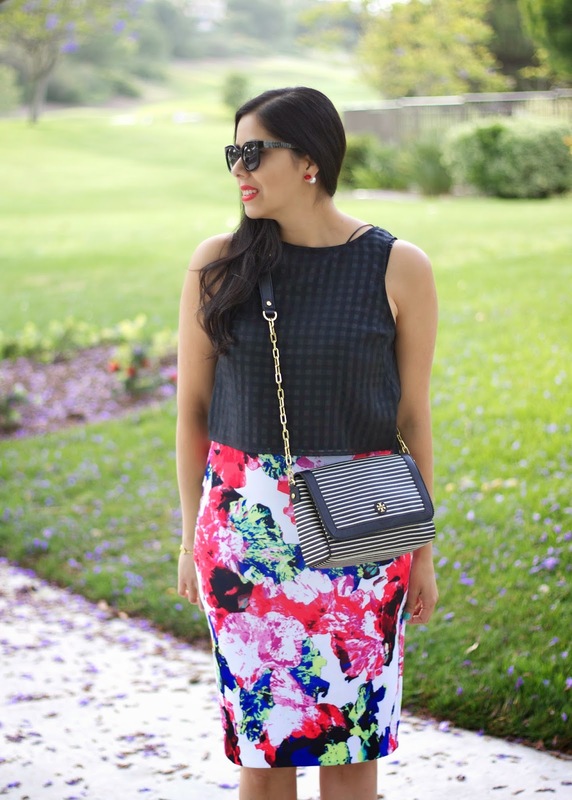 Love the vibrant floral skirt! Adorable outfit <3 Love the top with your printed skirt. So chic! amazing look! the skirt and heels are a gorgeous combination. amazing floral print!!! u look so pretty! xO! You can't beat a good print. Especially during spring and summer. I love that! Love this look! The floral skirt looks great with those gold heels! I'm a little obsessed with your skirt and heels! That is such a beautiful pencil skirt! I think the cropped black top works really nicely with it. I find pretty printed pieces are so versatile, and like you said they can work for so many events. Love this outfit! Sometimes you have to mix and match a lot of things to get that perfect pairing. You look lovely, great post! Really love this post!! Your shoes are beautiful!! Love the skirt and your shoes!